*Branding expert and lifestyles curator Oscar Generale comments on a color that we have seen all month long in honor of Breast Cancer Awareness month. The color is pink and it resonates worldwide as the symbolic hue for female babies, iconic perfumeries and men who dare to cross the color line, fashionably speaking of course. But what is the science of pink? The Original Guru of Business & Style breaks down the lure of the color chosen by First Lady Michelle Obama and Mrs. Ann Romney on the most fiery night of the 2012 presidential campaign, the debates between President Obama and Massachusetts Governor Mitt Romney on October 16th, 2012. First Lady Obama and Mrs. Romney. 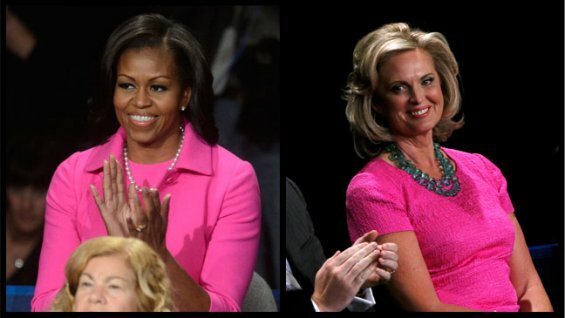 Two wives in pink cheer for their husbands at the 2nd Presidential Debate for the 2012 Election. When recording artist Pink performed at the VMA awards in 2008, thanks to the branding expertise of Oscar Generale she was adorned in Rebecca Jewelry. He also selected Nicolas Jebran Haute Couture when acclaimed Italian actress and beauty queen Denny Mendez lit up the red carpet at the amfAR Charity Inspirtation Gala in Los Angeles, on October 11th 2012. Denny was also wearing earrings by the Azza Fahmy Jewelry of Egypt. Pink is the ideal color for Breast Cancer Awareness and the month of October is dedicated to this cause. Pink is more than a color, it’s a symbol, a suggestion that speaks to the heart of all that matters. Follow Oscar Generale, the new O. G., The Original Guru of Business and Style at www.OscarGeneraleProductions.com.